Hidesato is the mythic hero who killed the giant centipede which had been terrorizing the area around Seta on Lake Biwa. The right-hand panel of this diptych - not seen here - shows a beautiful princess dressed in full regalia at the base of the bridge at Seta. Below is a description of one version of this myth found at printsofjapan.wordpress.com. "In olden times, when Fujiwara no Hidesato (藤原秀郷), who lived in the first half of the tenth century, crossed the Seta bridge, a big serpent was laying across it. The hero, however, was not at all afraid, and calmly stepped over the monster which at once disappeared into the water and returned in the shape of a beautiful woman. Two thousand years, she said, she had lived under this bridge, but never had she seen such a brave man as he. For this reason she requested him to destroy her enemy, a huge centipede, which had killed her sons and grandsons. 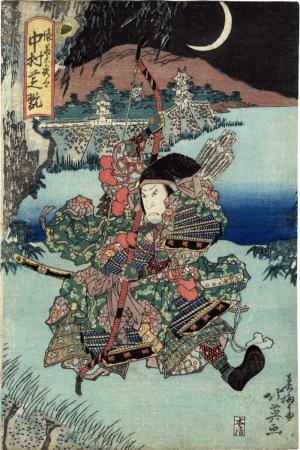 Hidesato promised her to do so and, armed with a bow and arrows, awaited the centipede on the bridge. There came from the top of Mikami yama two enormous lights, as big as the light of two hundred torches. These were the centipede’s eyes, and Hidesato sent three arrows in that direction, whereupon the lights were extinguished and the monster died. The dragon woman, filled with joy and gratitude, took the hero with her to the splendid Dragon-palace, where she regaled him with delicious dishes and rewarded him with a piece of silk, a sword, an armour, a temple bell and a bag (tawara) of rice. She said, that there would always be silk left as long as he lived, however much he might cut from it; and the bag of rice would never be empty ‘. As to the temple bell, this was the most precious treasure of the Dragon-palace.” This was the famous bell he gave to the temple at Miidera." Ikeda Bunko, Kamigata yakusha-e shūsei (Collected Kamigata Actor Prints), vol. 2, Osaka, 1998, no 337.